Genesis Sonic Spinball (USA) in 07:58.5 by mmbossman. Dr. Robotnik is at it again, and this time he has set up a Pinball Defense System inside of a volcano. 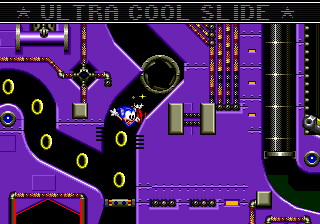 Fortunately, Sonic makes a good pinball and he easily infiltrates the system, recovering most of the chaos emeralds hidden within and making short work of the bosses. The author has improved this run by nearly 2 minutes over his previous. Improvements come from new shortcuts & glitches discovered by the author & Flip. For instance, Flip demonstrated in this submission how to skip collecting emeralds in the first stage.